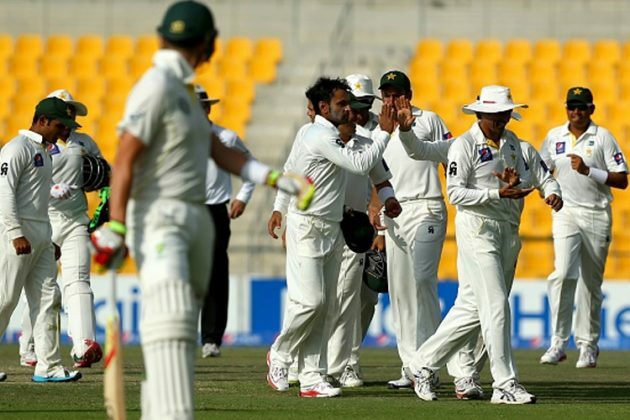 Pakistan completed a stirring win over Australia in the second Test to sweep the series 2-0, recording its first Test series win against Australia in 20 years. Misbah-ul-Haq, the captain, led the way in Pakistan’s huge 356-run win in Abu Dhabi, and complete a memorable two Tests for Pakistan, who had won the first Test in Dubai by 221 runs. Several records were broken and new benchmarks set over the two-Test series. Younus Khan led the way with successive centuries in the first Test, and a double century in the first innings of the second Test. Misbah joined the party in the second Test, setting a record for the quickest Test half-century and equalling the record for the fastest Test century. 221 – Pakistan’s victory margin in the first Test which was its biggest against Australia in terms of runs in their history – until its victory by 356 runs in the second Test in Abu Dhabi. 273 – The number of deliveries between a boundary in Australia’s second innings of the first Test. The longest-ever stretch is 379 deliveries by New Zealand against Australia at Perth in 1985. 80 – The number of deliveries that Sarfraz Ahmed took to reach his century in the first Test, which is the second-fastest of all-time among Test wicket-keepers. The only faster century was Adam Gilchrist’s 57-ball effort against England at Perth in the 2006/07 Ashes Series. 14 – Misbah’s Test wins as captain of Pakistan, equalling the record held jointly by Imran Khan and Javed Miandad. 21 and 24 – The number of balls and minutes it took Misbah to score his half-century, which was the fastest ever in the 137 year history of Test Match cricket. The previous records were 24 balls by Jacques Kallis against Zimbabwe at Cape Town in 2005 and Mohammad Ashraful in 27 minutes against India at Mirpur in 2007. 56 – The number of deliveries it took for Misbah’s second-innings century at Abu Dhabi – equalling Viv Richards’s record set in 1986 for the West Indies against England at Antigua. 74 – The number of minutes it took Misbah to score his century, which was the second-fastest of all time in Test cricket. Australia’s Jack Gregory scored a century in 70 minutes against South Africa in 1921. 1 – The number of Tests Australia has won in Asia since 2007. Of 15 Tests played, it has ten losses and four draws, with the only win coming against Sri Lanka at Galle in 2011. 236 – The partnership between Younus and Azhar Ali for the third wicket at Abu Dhabi is the highest for that wicket for Pakistan against Australia. 40 – The number of years – before Younus achieved it in the first Test – since a batsman had made two hundreds in the same Test against Australia. It was the New Zealand opener who Glenn Turner scored 101 and 110 against them at Christchurch in 1974. 14 – The highest Test score by a batsman dismissed in the first over of the innings. In Pakistan’s second innings at Abu Dhabi, Shehzad was dismissed for 14.The previous best was 12 (444W) by AB de Villiers vs the West Indies in St John’s, 2005. 27 – The number of centuries Younus Khan has now scored, the highest for Pakistan in the history of Test cricket. Younus equalled Inzamam-ul-Haq’s Pakistan record mark of 25 with his century in the first innings of the first Test, broke the record in the second innings, and went further up with his double-century in the second Test. 3 and 28 – Younus Khan became the 3rd Pakistani batsman to score 8,000 Test runs, after Javed Miandad and Imzamam-ul-Haq. He also becomes the 28th batsman from any country to join the ‘8,000 Club’ and has already moved past Mark Waugh and Sir Garfield Sobers into 26th on the overall run-scoring list. The only previous occasion when two batsmen from the same team have scored twin centuries in a Test was at Wellington in 1974 when the batsmen were brothers – Greg and Ian Chappell. At Abu Dhabi, Misbah became the oldest man ever – and the first over forty years of age – to score two centuries in the same Test. Don Bradman was 39 when he achieved it against India at Melbourne in 1948. It had been ninety years since a batsman had made three consecutive Test hundreds against Australia before Younus achieved this feat in the first innings at Abu Dhabi. Herbert Sutcliffe was the last to have done this, during the Ashes series of 1924-25.On the second day at Dubai, Sarfraz Ahmed was out to the last ball before tea and the not out batsman Zulfiqar Babar retired hurt and did not resume after tea. Thus two new batsmen appeared for Pakistan post-tea. The only other occasion this has happened in Test cricket was at Hamilton in 1996 when Greg Loveridge retired hurt on the same delivery from which Dipak Patel was dismissed. In the first Test Match in Dubai Steve O’Keefe joined a small band of bowlers who conceded at least 100 runs in both innings in their debut Test match. What does this mean? Four innings?